\Even Elestan seems to recognize the one sided gradual escalation. That does not seem to be a reasonable reading of what Elestan wrote. Unless you're oddly claiming that you're the only side to escalate, or that when you escalated it was anything but gradual? That’s certainly how it appeared here. First, they announce Ghosts and associatizte it with SC. Then they begin making public attacks on Stardock. Then they file DMCA notices. What escalation was Stardock doing? Even Elestan seems to recognize the one sided gradual escalation. Sounds to me more like you are twisting Elestan's statements to bolster your narrative. As for the litigation, layers escalate things. That’s why it’s better for people to work things out on their own. Yeah, blame the lawyers. Pretty sure everything goes to you for approval first. You’ve had an account here for an hour. And that was your first post. So what community are you speaking for? All Stardock has been doing, for four years, is making a new Star Control game. And we have spent that 4 years also trying to be respectful to Paul and Fred including not using the aliens from SC2 in the new game even though, as has been said, our position was we had a license to do so. We didn’t do anything to justify the attacks and blatant attempts to undermine our efforts. But we aren’t going to just roll over at Paul and Fred’s whims. And when they decided to escalate and attempt to kill our main investment in court, which effectively would ruin us, then yes, we are going to use what legal means we have to defend ourselves and ensure we are protected. We are also not the ones who hired a PR firm just to smear those we disagree with. Every time we see a brand new account, o e has to wonder, actual person or PR flak? They didn’t hire a PR firm for Ghosts but to smear me by name? Sure. Sometimes, in a dispute, one side is almost completely at fault. And it’s not Stardock as I suspect the courts will make clear once all the information is public rather than the tiny selected chunks Paul and Fred release to dishonestly mispresent the facts. I don’t expect you guys to change your minds. Many of you, like me, have decades of seeing Paul and Fred in a certain way. It takes a lot of bitter experience to change that impression. I can assure you that I am not a PR guy hired by whatever firm as I was an avid Star Control player during my high school days in the 90s. I had an account on the TUQ forum long ago but cannot remember the email I used and lurked on several Star Control boards periodically like The Path of Now and Forever, etc as there wasn't much news. Pretty certain more than a few people do the same so for you to call me out as a PR guy makes me LOL. ^ It's cute how you ignored the rest of Brad's points. Its cute how you defend Brad everywhere. Stardock supports the UQM project and will be donating the SC3 source once the legal mess is over. That's a great move, but I think from the prospective of people who own UQM branches, the threat of a company holding trademarks on the alien names tends to outweigh the benefit of getting the SC3 code (let's face it; it wasn't a great game). I believe you're a fan, and wouldn't do anything against the project, but if Stardock were acquired, who knows what would happen. You'd need to make some kind of irreversible trademark license similar to the GPL to remove that threat, and I'm not sure how that would work, legally. As for the litigation, layers escalate things. That’s why it’s better for people to work things out on their own. Even Elestan seems to recognize the one sided gradual escalation. I certainly see escalation, but I do see it from both sides. P&F were the first to take the dispute public, and appear to have been the first to bring in a lawyer (for the DMCA action). But Stardock filing a full lawsuit was an escalation from a DMCA request, and its trademark filings were further escalations. I don’t know what is worse, that they violated the confidentiality of settlement talks or that they so misrepresented it, in either case, we are legally forbidden (as were they) from discussing it. I feel for you on this, and I do try to stay aware that their posts might be cherry-picked information - that's why my initial response was to give you the chance to refute it. Now that it's out that there is a confidentiality order, I think their posts will be met with more skepticism. To me, at least, saying that you are legally barred from responding to something is actually a fairly good (if temporary) defense. Someday, the whole truth will come out, and in the interim, I assume the court will enforce its edicts. So, that's a position that still troubles people, because the Accolade contract language looks like it would have terminated that license. If you can explain why you think you still have a license, that could shift the perception of what Stardock can reasonably demand in this suit. We are also not the ones who hired a PR firm just to smear those we disagree with. Every time we see a brand new account, one has to wonder, actual person or PR flak? Well, I guarantee I'm not at a PR firm; I can think of few jobs I'd like less than being a shill. I'd like to hope that keeping a calm narrative tied to known facts will actually serve as a counter to any baseless claims a PR firm might make. To be honest, the countersuit and the accompanying documents regarding the GoG issue a few years ago does bolster the FF/PR narrative of Stardock selling the game without agreement from FF/PR. As Atari confirmed, Atari would've needed agreement from FF/PR to sell the games SC1/SC2/SC3 on GoG. Therefore I am inclined to believe them when they say the DCMA request towards steam is legally well based. Your insistence that the DMCA requests are illegal just is the opposite narrative. And it shows that you do feel hurt by the potential loss in income, however small I suspect the sales actually are. Agreed, any successful DMCA may become dangerous once you start selling the new game in earnest, but so far I've not seen convincing arguments saying Stardock can sell the old games without prior approval from PR. But what will happen if the court decides that you would've needed their approval before selling the old games on steam? That the DCMA take down requests were reasoned and lagally sound? And your willful continuation of the sales? Will the damages end the development of SC:Origins ? The whole contract languages, on top of the Atari/GoG e-mail chains seems to indicate that this isn't as clear cut as you make it. I actually tend to read it rather clear in the reverse direction of your reading. And if a court finds that too, then Stardock will have sincere issues. As that will hurt their Trademark standing too. This whole issue is complex and the topics have become interwoven. To be honest, I likely would've sent a DMCA request as well to protect my copyrights on old games in FF/PR's shoes; especially with the background of having won an extremely similar case for the GoG distribution "back then", when Atari agreed that Atari did not have the rights. I'll be looking forward to have this mess sorted, but I fear that won't come very soon. And until then, development time for GotP and SC:O is hampered by the time ressources necessary to sort this out. Again thanks to you, Frogboy, for coming here and writing to us. No, UQM is not under fire nor will it ever be. Though I would be more concerned about the forum banner using the 3DO box art. Even Brad's promise following your post doesn't guarantee that. Suppose Stardock wins the case and successfully registers as trademarks everything it has claimed. Those trademarks are all used in UQM. If Brad's lawyers come to him and say that allowing UQM to employ those trademarks unchallenged makes it likely that Stardock's winning case against Paul & Fred will be overturned, can he afford to endanger SC: Origins and all the money Stardock put into it in the name of ensuring UQM remains unmolested? That may not happen; my sense is that it's unlikely to happen. But nobody can make any definitive statements until the court cases have been resolved. My updated take on the situation (if anyone cares): Much of this mess is down to the nature of fandom generally and SC/UQM fandom specifically. Because I'm guessing we all know about the "SC3" thing, where although the game is an official sequel published by a company with the rights to do so and designed and written by people who were themselves fans, Paul & Fred weren't involved and the subsequent fan position has been to delegitimate the game (seriously or not) and suggest that it shouldn't be considered part of the canon because the Great Implementors were not involved in its creation (and because it's not very good in comparison to SC2, I suppose). Simmer for decades. When Brad and Stardock come along to create a new Star Control, the question of Paul & Fred's involvement immediately came up, and in association with the legitimacy of any sequel produced. Brad was clearly concerned enough about the response to leave an ongoing impression that he was in communication with Paul & Fred, that the project was proceeding with great respect for them, and that Origins was starting a new story instead of continuing the story from SC2 because that sequel was for Paul & Fred to provide. There's immediately several problems stemming from this situation. Firstly, Paul & Fred have left the impression that they were in no way collaborating or interested in collaborating, that they were not involved with this project, and that they wanted nothing to do with it. They have also suggested that Brad was not in ongoing communication with them. As we all know, Brad's a fan and I'm sure he would have welcomed a direct collaboration (for business reasons, too), but it's also understandable that Paul & Fred didn't want to create their own sequel for someone else. They don't seem to have liked Brad from the beginning of the process, either, for whatever reason, and that certainly seems to have blossomed as events proceeded. I note in passing that there's no requirement that people like each other, even if one party was a big fan of the others and spent a lot of money and trouble securing the rights to continue a franchise that he loves. Paul and Fred acted gracelessly, but they weren't under obligation to do otherwise. 1. Brad gets in touch (perhaps muitiple times in multiple ways) to involve them in the new project. They want nothing to do with Brad. They tell him so. 2. Brad implies that while Paul & Fred aren't currently involved, he's communicating (perhaps even consulting) with them as Stardock moves forward. Multiple choices of language and communication reinforce that impression, like the repeated statement that the SC races which are Paul & Fred's IP aren't being used "out of respect" and not because Paul & Fred rudely denied all requests and refused to discuss or negotiate. I obviously can't read Brad's mind, but I do have to say that advertising the Ghosts of the Precursors project anywhere (including here) if its initial posting was basically a huge FU to Stardock is frankly baffling, and the only reason I can see to do so is the combination of the fan's "I really want to play this" and the businessman's "continued association between myself and the Great Implementors can only help sell copies of SC: Origins." From Paul & Fred's perspective, this isn't enthusiasm, it's another series of moves to claim the goodwill and admiration their work created for the franchise while cutting them out. 3. Somewhere in here, Stardock tells Paul & Fred they can't use "Star Control" in their press release. I don't know if a lawyer came to Brad and pointed out a problem he hadn't noticed, or what happened. Paul & Fred are in the wrong (except inasmuch as they are the people ultimately, if not solely, responsible for SC 1 & 2), but they are also pissed. And here again, the fandom legitimacy problem rears its ugly head. Because at this point, either Star Control: Origins is no longer legitimate, or Ghosts of the Precursors isn't, but the only way Stardock can possibly win that battle given that (following SC3) Paul & Fred define legitimacy in one regard, but legally Stardock owns the franchise, is to undercut Paul & Fred's ability to grant imprimatur. In other words, from now on, Paul & Fred can't be the arbitors of what is or is not related to the UQM; Stardock must be. But from Paul & Fred's perspective, the only way that happens is if their creation is taken away from them. And of course, from their perspective (and possibly legally, depending on how that goes), Stardock never owned what makes Star Controls 1 & 2 Star Control, which isn't the name but the IP which they developed. So they pull back with all the resources at their disposal, not just because their new project is under threat, but because they now believe that Stardock is trying to take away all the labor they put into creating their setting. Coda: The Stardock FAQ characterizes some things very differently from Paul & Fred, and I'm largely taking the Paul & Fred characterization because Stardock's makes everyone look better while Paul & Fred's version of events makes Paul & Fred look worse. I believe Stardock was in a one-sided communication with Paul & Fred in the hopes of bringing them around on involvement in the project, for reasons articulated above. And I believe that Paul & Fred already had animosity towards the attempt and maintained a stubborn silence. Indeed, if they were planning to create a sequel and given how IP rights work, they may have seen any information Stardock shared with them as an attempt to lay the foundation for a future lawsuit claiming that Paul & Fred stole ideas. Paul & Fred clearly want nothing to do with Stardock or their project, and the mess partly involves the danger to Stardock and Origins from the fan respect paid to Paul & Fred. What if the game comes out and they do interviews panning it and saying "It's 'Star Control' just like 'Star Control' 3?" October 9th 2017 was a GREAT day. (The best day since I finally figured out the 3DO word I couldnt quite understand was Procyon) Us fans not only had the rebooted game that had hyped for such a LONG time possibly getting a release date, BUT we ALSO had the true sequel we had been waiting for. Now today March 20th 2018 I couldnt be more depressed. Reading about the legal escalation im realizing that at the end of the day the fans are going to be the biggest losers in all of this. We were better off just fantasizing about a sequel than we are having it dangled in front of our faces. Everyone involved should be ashamed of themselves. I'm just going to wait and see. All this side arguing about things we have no control over is heckin' tiring. So for now, I'm out of this topic until things clear up. … But Stardock filing a full lawsuit was an escalation from a DMCA request, and its trademark filings were further escalations. On top of this I would add the note that the lawsuit contained outlandish claims that bordered on insult. This was not simply 'a lawsuit'. Also, the trademark filings were not merely escalations vs P&F, but also against the project this site is devoted to. We were getting along very well with no one having a trademark on UQM, or Yehat. Someone's holding that trademark can only make things worse, if only to place a sword of Damocles above our heads that it might eventually be used against us, even if the current holders do nothing - that can be sold, just as you bought it. But for the sake of argument, let's say that the court rules that the sale agreement has expired. Then the games come down. I think they've netted around $10k in their lifetime on Steam give or take or about the cost to answer one legal brief. The underlying question is why they suddenly wanted them taken down. And we will get to that. Second: The license to use the old IP in sequels. This one is very murky. It's not relevant since we aren't using any of the IP. But let's presume that the license agreement has expired. Ok. We aren't using those characters, setting or lore. So it's has no effect either way. Has Paul and Fred given the impression that Ghosts of the Precursors is related to Star Control? If yes, they lose. That is almost verbatum what a jury instruction would be. The follow up would be, did Paul and Fred intentionally give the impression that Ghosts of the Precursors was related to Star Control. If yes, then things get a lot worse for them. There's no wiggle room on that. They wanted Ghosts of the Precursors to benefit from the good will fame of Star Control. And they did and received a great deal of press coverage and we were harmed in the form of customers asking for refunds because they thought that Origins was the "real" Star Control. Now, if they lose they are liable to the damage they have caused us during the course of this. What percentage of sales do you think have been lost due to Ghosts of the Precursors and Paul and Fred's postings? Or put another way, if X is what Star Control: Origins would have made before Paul and Fred's actions starting in October and Y is what it would be now what % of X is Y? Obviously, I would prefer none of this be publicly discussed. This is why when we filed the complaint in December you heard nothing from us until after Fred and Paul posted a press release announcing their countersuit against our "theft". “… It is important that our players are not confused about which game they are getting, so we need to clearly distinguish our respective projects. That separation should fall along our respective rights, Stardock having purchased the Star Control trademarks and Fred and I owning all the IP rights to the works we created." Yes. That. And if they had done that, and then asked us to take down the DOS games, we would have just like we voluntarily took out Super-Melee at their request BEFORE they reneged on what they posted. After they did that, things got a lot more complex. To put things in perspective, Sins of a Solar Empire has made over $50 million in its run so far. We expect Star Control to do in this neighborhood too. What % of the potential sales do you think they've cost us due to their actions? Such as our inability to get media coverage that doesn't mention Ghosts. The shadow of there being a competing Star Control game from "the creators" creating uncertainty with channel partners, overseas distributors, OEMs. And that's before you get into their public attacks on us and inciting fans. This isn't about ego or pride. It's about the livelihoods of the my coworkers. It's about delivering on our promises to the fans. Paul and Fred's action have put our livelihoods at risk and for what? We aren't using those characters, setting or lore. So it's has no effect either way. Sure, that sounds right. And if your suit was focused on calculating and getting those damages, I think it would play a lot better; if you look at what people are saying, they're not giving you flak for your trademark damages. They're giving you flak for the stuff you're doing relating to the old IP, which you said above that you aren't using and has no effect. So my advice (which is worth what I've been paid for it) is to stop fighting them over the old IP. You've already said it doesn't matter for SC:O, and if that's true you're doing yourself far more goodwill damage than any gain you could reasonably expect to get from it. You might well have lost more SC:O sales by that loss of goodwill than from any confusion P&F's trademark-infringing post may have caused. I do recall that you've said that part of why you were attacking their old IP was in case they might assert you're using it. You've said you're not, and I'm assuming that's true - especially if you were to stop claiming that their universe was part of your multiverse. I see a possible trade here: Even if you concede their IP claims on the old games, P&F would still need a license from you if they want to sell them, because they're still called "Star Control", and that's still your trademark - I really doubt they can invalidate that, and my advice to them would be to stop trying. So trade them a trademark license to sell the old games, in exchange for their guarantee that they won't question your trademark, and won't sue you over any vague similarities your universe might have to theirs (and you agreeing not to use the old races, etc.). Then they pay you an appropriate fine for their October post, and you're both back to making games again. First: The right to sell and distribute the classic games. The fiimpact of these two issues is indeed rather small. Yet, the first one has a huge personal impact on those who create the IP and believe it is their property. Private persons tend to react more emotional, and thus less rational. But they may be just as aggressive defending their rights. Here I differ from your belief what the jury instruction will be. GotP will be the continuation of the storyline started in Star Control II, told by the creators of Star Control II, and thus will be the continuation of Star Control Ii, and is therefore related to Star Control. It will not be related to the Star Control franchise anymore, as that is now owned by someone else. But how can you describe what you're doing without referring to the names of the original product? 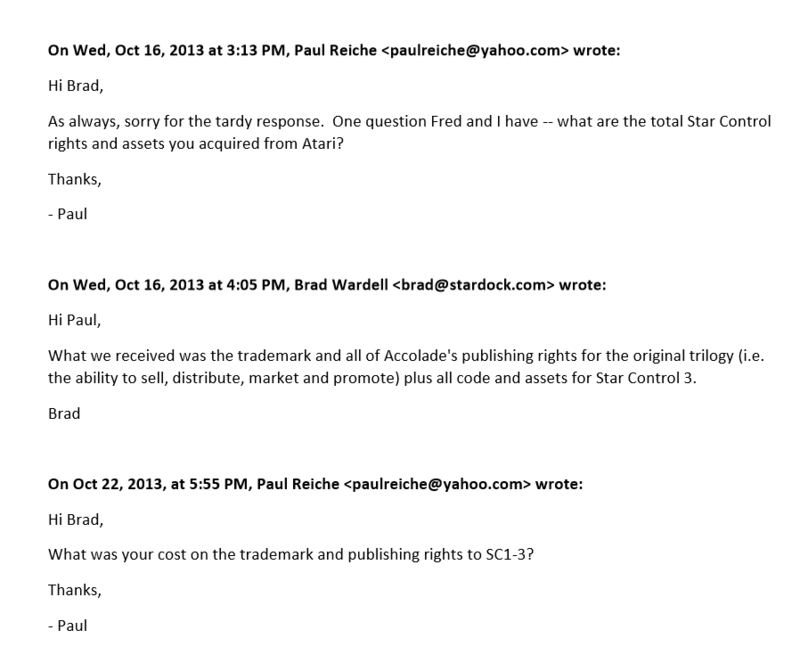 Just as Stardock wishes to cash on the goodwill the name Star Control carries because of the success of the first two of the classic games of the series. When I read that Star Control 3 was not created by the original creators, but continues the story, I already felt cheated. I faultily associated the name with the goodwill I had for the original story. Hence, now I have the same issue with SC:O. It carries the name of something I love, but will not continue why I love Star Control. Hence, for me, it lost the goodwill you associate with the trademark name. So, the real question for the jury will be where the goodwill lies: with the intellectual property or with the trademark? Short: I'm of the opinion that you're riding on someone else's goodwill when you use the name "Star Control". But such is the current nature of civil law. Difficult to quantify. As any "if/when" question. Which is standard operating procedure for legal stuff. What % of the potential sales do you think they've cost us due to their actions? Such as our inability to get media coverage that doesn't mention Ghosts. The shadow of there being a competing Star Control game from "the creators" creating uncertainty with channel partners, overseas distributors, OEMs. And that's before you get into their public attacks on us and inciting fans. Well, getting media attention is an issue for you, yes. But not their fault. The shadow of another game which fans may even like better because it comes from those who created the original IP? Unlucky timing for you, I agree to that. But again, this shows who and what those in the business associate with the goodwill you always exclusively try to associate to the trademark. How many of your preorders have been cancelled, because the customers found out that your game will not be written by the original creators, and thus wll have nothing to do with what they associated their good memories with? I fear we'll never know, because the refund box has no box yo can check for "I wanted a continuation by FF and PR, not another game with only the trademark to show". And some in the last weeks may even have decided to ask for a refund because Stardock seems to,be attacking the foundation of the original games. Who the creators were, and trying to grab trademarks unrelated to the game in development. Well, honestly I've heard of Galactic Civilizations. Never played it thogh, and thus did not know of Stardock, until Stardock bought the trademark Star Control. So far only Microprose was a company where I looked for new games. WHen Sid Meyer left MicroProse, Firaxis was able to take that spot. Otherwise every game has to make it by itself for me. Well, the media coverage alas led to many realizing that their money was put on a horse just like SC3 was. Actually even worse, as there won't even be the pretention to solve some of the open questions of Star Control II. If that is what they wanted, and now realizing where the new game is going, they of course try to limit the damage to themselves by asking for a refund. But your fight for your employees I can get fully behind. Even if I think it's not been FF and PR who risked your livelihoods. The risk of a game flopping is simply part of the business. And you are rather close to publication, compared to FF and PR, who have so far only announced the start of development. I expect their game to appear quite a while after yours. Depending on the scope of project, which we still not know about. Honestly, If Paul Reiche would start writing a novel as continuation of the story I love, instead of a game, I would buy his book. If I had only money for his book and your game with excellent critics, I would still buy the book instead of your game. I simply want the story, not "a Star Control" game. Anyway, I still hope it'll work out for both sides. SC:Origins sounds interesting enough that I do wish it success! But until I've read more about what happened, I'll stick to my decision. And that reminded me once again to be thankful for your patience with us fanboys and giving us some answers here. So, thank you, Frogboy, for this civil discussion and comments from your side. I hope my take is as civil as I hope and intended it to be. I've seen repeated claims that posting the terms of the settlement offer was a breach of confidentiality. There's someone on the Stardock forums claiming it is illegal to discuss settlement offers in public. That extreme seems quite clearly farcically wrong, but is there any specific information anywhere that the court ordered that the specifics of the settlement offer not be divulged? The fact that they WERE divulged is pretty clearly paired with a refusal to accept them. I am very curious why and under what circumstances settlement offers would be accompanied by a court order not to make them public. The only cases of which I am aware are settlements that are accepted in which case non-disclosure of the details is a standard component. But that is not the case here. So I would like to know why this "breach of confidentiality" stuff is getting waved around, if anyone can fill that in.